At 14.12 hours on 8 Apr, 1943, U-123 fired a spread of three torpedoes at the neutral Castillo Montealegre (Master Francisco Zamora Esclarans) and observed two hits after 37 and 38 seconds. The steamer capsized to starboard and sank after two minutes west of Conakry, French Guinea. The survivors were questioned by the Germans and answered Espaniol when they were asked about the name of the ship. 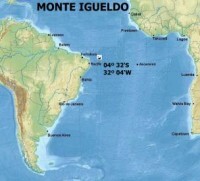 The Germans had identified the ship too late as a Spanish freighter of the Castillo Montealegre type and the BdU initially ordered the commander to held this sinking top secret and to remove the incident from the war diary, but some days later the order was given to write the incident into the KTB. The master and 28 survivors were picked up by HMS Inkpen (T 225, ) but twelve survivors had abandoned ship on a raft and were never seen again. Some sources claim that the Italian submarine Archimede (TV Guido Saccardo) was responsible for the sinking of Castillo Montealegre because the Germans did not admit an attack in the area and the Italian submarine did not return from her patrol. But on that day the submarine operated off the Brazilian coast and on 15 April was sunk by two PBY-5A Catalina aircraft (VP-83 USN) northeast of Natal in position 03°23’ S, 30°28’W.